Andy Lee, Irish light middleweight fighter, currently ranked WBC # 6 will be in action again against John Jackson ranked WBC #4 for the vacant NABF light middleweight (154lb) title this Saturday evening at Madison Square Garden, New York City. 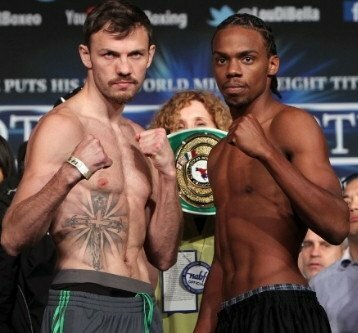 At the weigh-in for the fight Lee (32-2, 22 kos) from Limerick, Ireland tipped the scales on weight at 154 lb with Jackson (18-1, 15 kos) from St Thomas, U.S. Virgin Islands weighing 2 lbs lighter at 152 lb. The Irishman has spent the last 8 weeks preparing for this fight with his astute trainer Adam Booth at the Boxing Booth Gym, London. The former 2004 Irish Olympian is primed for action and relishes the opportunity to fight at the Mecca of boxing at such a prestigious boxing event. The Irish southpaw certainly has plenty of experience and ring craft to trouble the talented 25 year old Jackson. Lee also has other useful weapons in his arsenal such as power in both hands to hurt and take a fighter out. Previous boxing news: Cotto vs. Martinez: Will Martinez float like a butterfly and sting like a bee?